Doha, Qatar (AFP) – Qatar and France signed a deal Monday to cooperate on security and economic matters, in a boost to the tiny Gulf state still locked in a diplomatic rift with neighbouring Saudi Arabia and its allies. Qatar’s top diplomat Mohammed bin Abdulrahman Al-Thani met with his French counterpart Jean-Yves Le Drian in Doha to sign the “strategic dialogue” agreement. The deal marked a “new phase” for the two countries, Al-Thani said during a press conference. “This platform will include cooperation in different areas between the two countries, including defence security, regional security as well as energy, economy and culture,” he added. 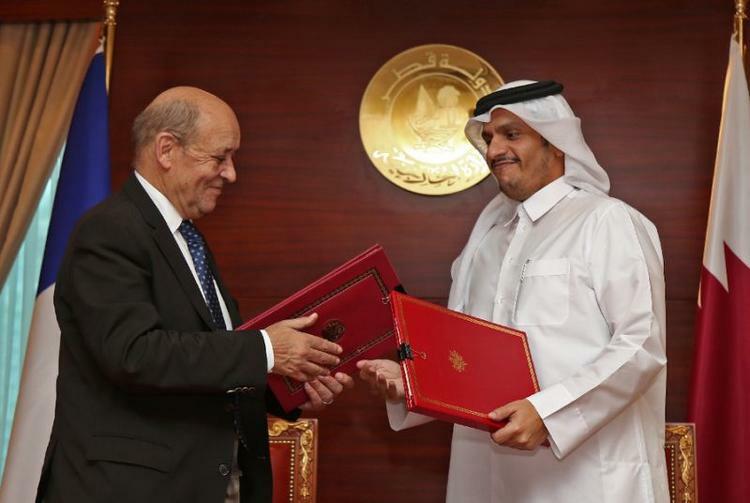 Le Drian said the agreement “obliges” Paris and Doha to have regular meetings. The energy-rich Gulf state has been spending heavily on defence since June 2017 when a group of former allies — including regional powerhouses Saudi Arabia and the United Arab Emirates — cut ties with Doha and enforced a political and economic boycott. Saudi Arabia and its allies accuse Qatar of supporting terrorism and seeking better ties with Iran, Riyadh’s regional arch-rival. Qatar owns famed French football champions Paris Saint-Germain and next month will see the opening of Doha’s multi-million dollar national museum, designed by French architect Jean Nouvel.